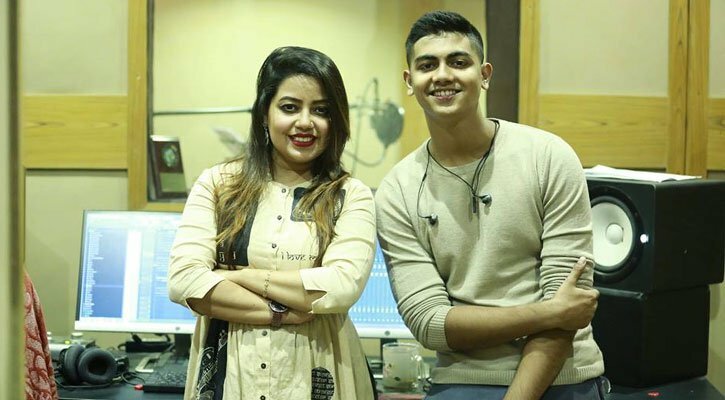 Singer Mahtim Shakib, who garnered recognition for his cover numbers on YouTube, has collaborated with popular singer Dilshad Nahar Kona for a brand new duet. The song will be used as the title track of web series ‘Kuasha’, and has been named after it. Kuasha is directed by Mohammad Mostafa Kamal Raz. Johny Hoque has penned the lyric and Naved Parvez has tuned and arranged music for the song. Kona and Mahtim have lent voices to the song at a studio in the city on Sunday (Dec 2). “I like Mahtim Shakib’s singing style. I didn’t know before the recording that it is his first duet. In that sense, I believe this song will be a different one to the audience,” said Kona. “All the songs I have sung till present are singles. Have sung the duet for the first time ever. I will be very happy if the listeners like the song of Kona apu (a sister) and mine,” said Mahtim. However, actress Tisha has paired up with ABM Sumon in Kuasha. The web series, based on a story about crime world, also stars Shahiduzzaman Selim.